Every architect has horror stories about construction quality on job sites. The United Brotherhood of Carpenters (UBC) union wants to prevent that, investing $250 million for a training center in Las Vegas to teach and certify their workers. 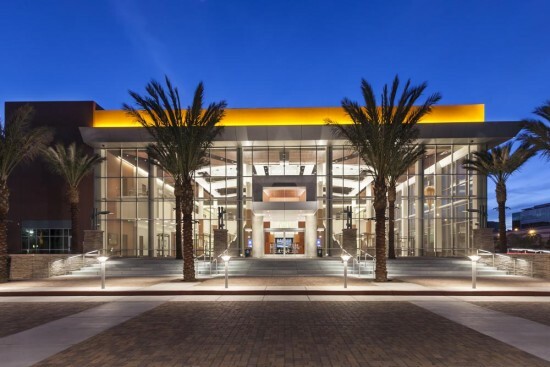 The group has been building the International Training Center, just outside McCarran Airport, over the past several years, and recently completed phase five of the complex, bringing its total size to almost 1 million square feet. The facility features more than 70 classrooms, its own dorms (with 300 guest rooms), and training shops fitted with facilities like scaffolding mock ups, concrete form making stations, a pile driver pit, flooring stations, glass curtain wall mock ups, turbine pit, a robot zone, and even a tank to practice underwater welding. Third year apprentices from around the country train here for two weeks at a time. They include general carpenters, interior systems carpenters and drywallers, millwrights, floor coverers, millworkers, cabinetmakers, framing and residential carpenters, pile drivers, lathers, scaffolders, roofers, and workers in forest-product and related industries. 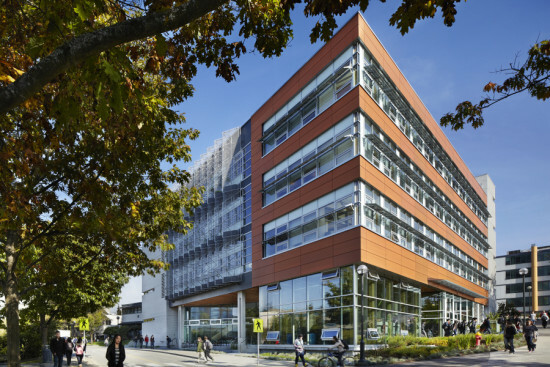 The UBC sponsors more than 200 training centers across North America (there are about 3,500 full- and part-time instructors associated with the UBC), but this is by far the largest. “Our job is to make sure our members are trained and ready,” said Bill Irwin, executive director of the Carpenters International Training Fund. An abstracted version of a street tree, a canopy of tessellated irregular polygons balances atop slim steel posts. 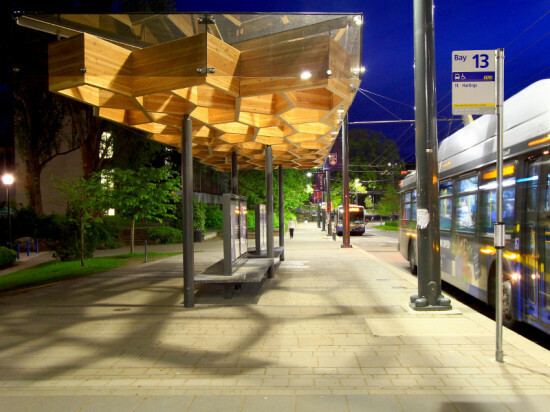 When Public: Architecture + Communication visited the site of the transit shelters the University of British Columbia had asked them to design, they found that something was missing. The main point of entry to the campus, University Boulevard is lined with trees—except where the bus shelters would go. “There was this language of gaps that we noticed,” said Public’s Christopher Sklar. The shelters themselves, they decided, should fill in the tree line. The designers were left with a question, articulated by Sklar: “How does it be a quiet piece but also something interesting and unusual that relates to its surroundings?” Beginning with the image of a tree’s branch structure, Public placed a wood canopy defined by a repeating pattern atop slim steel posts. As for the pattern itself, the designers considered a range of options, from Moorish patterns to simple geometric shapes. The trouble with a geometric pattern, said Sklar, is that it is “often a static thing. We looked at triangles; they’re just triangles. Add a side, it’s just a square.” But if you add one more side, you have a pentagon. And that is where things get interesting. The tessellation of irregular pentagons is surprisingly complicated, on both a mathematical and an aesthetic level. “The thing that we liked about the repeating pentagon is that it creates something that is repetitive, but it’s also something that’s fluid and dynamic,” said Sklar. “It doesn’t feel like it’s repeating when you’re actually in it. It’s kind of a flowing structure above you.” Public alternated between Rhino and Grasshopper, finding that it was easier to perfect a line drawing and plug it into Grasshopper than to allow Grasshopper to generate the tessellation. “I think it’s one of these things where it’s a new technology, people want to see what it can do, think it can help you generate forms,” said Sklar. “But it’s taking away the last thing we have left to us. We’re designers, we want to shape the thing.” The team built a full-scale model of two of the canopy’s cells to get a sense of their size, hoisting the cardboard shapes onto the ceiling pipes in their Vancouver studio.